LeBron James is the best player in NBA history, bar none. He is one of only two players to average at least 25 points, six rebounds, and six assists for his career — LeBron's numbers are actually 27.1, 7.3, and 7.0 — the other being Oscar Robertson. He is one of five players with at least four NBA MVPs, alongside Wilt Chamberlain (four), Michael Jordan (five), Bill Russell (five), and Kareem Abdul-Jabbar (six), and he's not done yet. And, as you well know, he is the only player in modern NBA history to play in seven straight Finals — sorry, James Jones doesn't count, as he missed the 2014 postseason. Yet those are just accolades and numbers. LeBron's ascendancy is evident every time he steps foot on an NBA court. He is the most versatile player the game has seen. He can guard all five positions; he can play point guard and power forward on the same offensive possession. He is among the smartest basketball players ever, with an IQ rivaled by only Magic Johnson in the modern era. He's unselfish (to a fault), a leader and someone who's always looking to make the right play, no matter how much flak he might take for it. Kobe Bryant was a better scorer; John Stockton a better passer; Scottie Pippen a better defender; Shaquille O'Neal more dominant. None combined every facet of the game of basketball into a complete package the way LeBron has (although Magic and Larry Bird came close, minus the defense). Truly, LeBron is the best basketball player to this point in NBA history — but he's not the greatest. That would still be Michael Jordan, of course. For the past week, we've explored just how far the gap between these two players is. We ran through their teams (yes, LeBron had better teammates, but it's closer than you think), who faced tougher playoff competition (LeBron, by a hair), and a tale of the tape breaking down why LeBron is a superior basketball player to His Airness. Looming over all of that discussion, though, is LeBron's imperfect Finals legacy. 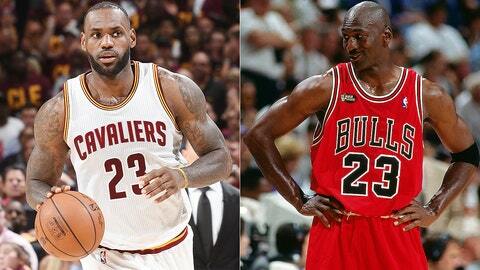 On multiple occasions, The King has come up way short — unlike MJ. 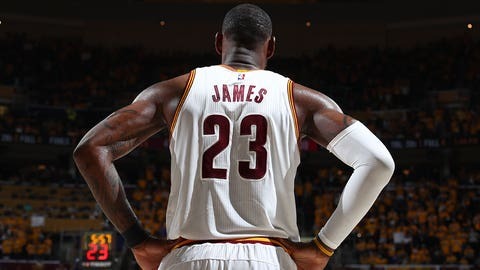 Those failures deprive LeBron of any legitimate claim to the throne as greatest of all time — because when we as fans talk about the GOAT in basketball, we don't mean the best player ever, or even the most accomplished. Instead, we as a basketball-watching society have defined "the greatest of all time in the NBA" as "the best superstar who had the most team success without a loss in the Finals." 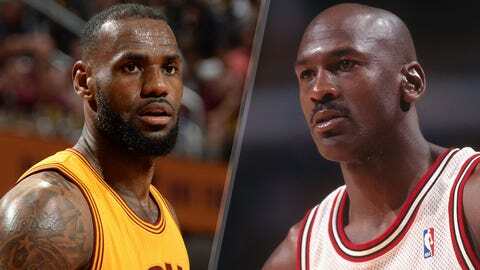 "Greatest" and "best" are two very different concepts in our sports conversations. The former subsumes the latter, entrapping us in the mental gymnastics necessary to believe in earnest that LeBron isn't the greatest because his team lost a couple times. Playing the game at the highest level we've ever seen isn't enough. We insist that our basketball legends stand as symbols of enduring excellence. We want a GOAT who never lost when the stakes were their highest. In short, we lionize Jordan because we want to believe he never failed, as we so often do in our own lives. We don't want a hero who reflects our own imperfections. We want Superman and his unimpeachable greatness — a tongue-wagging, cape-wearing exemplar of how to leverage being a complete jerk into a perfect six-for-six Finals record. No matter what LeBron does the rest of his career, he will never top Michael Jordan for that loftiest of distinctions — "greatest of all time." He lost his chance when he lost to the Dallas Mavericks, and again when his body got the best of him against the San Antonio Spurs. ... unless we decide enough is enough, that is. We can shift this conversation. We can embrace nuance and appreciate that while Jordan might have been the greatest up until this point, his Finals record is overrated. We can appreciate that a conversation about "all time" superiority is flawed on its surface, when what we're really talking about is who's been the greatest so far. 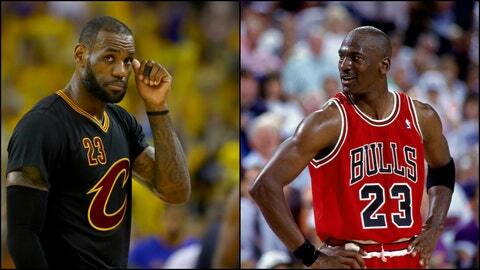 LeBron's challenge to Jordan's supremacy means we can reassess how we view greatness in the NBA. We can open the discussion back up to the ages, acknowledging the ascendancy of guys like Magic and Bird and Dr. J and Wilt and Kareem and Oscar. If we want to ignore that the world keeps evolving — that our professional athletes improve by leaps and bounds with new advances in technology and training — and that there's a lot more randomness in this universe than we ever want to admit, then let's keep shrieking about how Jordan is the unassailable GOAT. I'll be over here marveling at The King. He might not be the GOAT, but he's absolutely the BOAT.